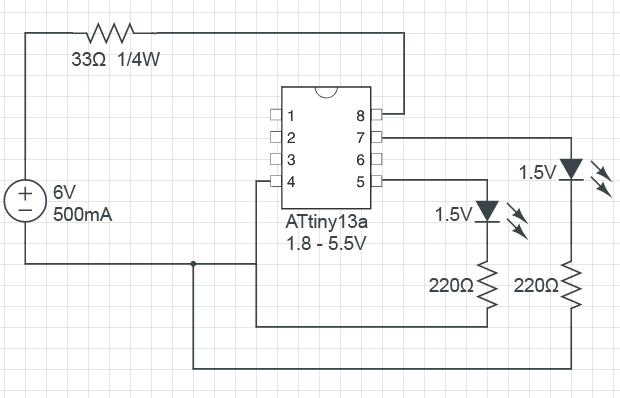 Which circuit is better for my ATtiny13a mcu setup? I have this ATtiny13a(http://www.kynix.com/Parts/159833/ATTINY13A-MMF.html) mcu led setup that uses total of 33mA when both leds are on and it works perfectly when powered through usb output. My problem is that now I want to power it using a 6V 500mA wall adapter, so I want to drop the 6V to below 5.5V since ATtiny13a mcu works at 1.8-5.5 Volts range. I have come up with two different circuits to achieve this small voltage drop. Please advice which one of these circuit is better. If both are not good then do tell me other options. Use a 1N4007 diode in series with Vcc. Use a small 33 ohm resistor in series with Vcc. I checked the wall adapter with a multimeter and it outputs 5.89 volts when no load is connected. Re: Which circuit is better for my ATtiny13a mcu setup? Hello. A better idea is to use a 3v3 regulated power supply from the battery source to your microcontroller. Being low current, a ldo regulator like spx1117m3-33 should be fine. Check the datasheet from Exar for full details. If you must use the diode idea then consider each such diode offers a typical 0.6 volt drop (Vf) so use more of them in series to lower the voltage to be say 4 volts or lower to avoid damage. Other ideas are to apply a zener diode; or use the Tcr2ef sot-23-5 ldo. Each is a low cost solution. and many more on ebay, etc.